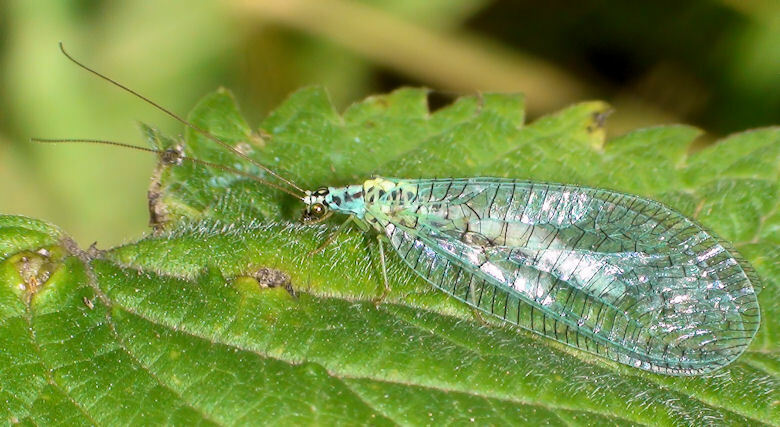 Green lacewings are insects in the large family Chrysopidae of the order Neuroptera. There about 85 genera and (differing between sources) 1,300-2,000 species in this widespread group. Members of the genera Chrysopa and Chrysoperla are very common in North America and Europe; they are very similar and many of their species have been moved from one genus to the other times and again, and in the non-scientific literature assignment to Chrysopa and Chrysoperla can rarely be relied upon. Since they are the most familiar neuropterids to many people, they are often simply called "lacewings". But actually most of the diversity of Neuroptera are properly referred to as some sort of "lacewing", so common lacewings is preferable.Green lacewings are delicate insects with a wingspan of 6 to over 65 mm, though the largest forms are tropical. They are characterized by a wide costal field in their wing venation, in which the cross-veins are . The bodies are usually bright green to greenish-brown, and the compound eyes are conspicuously golden in many species. The wings are usually translucent with a slight iridescence; some have green wing veins or a cloudy brownish wing pattern. The vernacular name stinkflies, used chiefly for Chrysopa species but also for others (e.g. Cunctochrysa) refers to their ability to release a vile smell from paired prothoracal glands when handled. Adults have tympanal organs at the forewings' base, enabling them to hear well. Some Chrysopa show evasive behavior when they hear a bat's ultrasound calls: when in flight, they close their wings (making their echolocational signal smaller) and drop down to the ground. Green lacewings also use substrate or body vibrations as a form of communication between themselves, especially during courtship. Species which are nearly identical morphologically may sometimes be separated more easily based on their mating signals. For example the southern European Chrysoperla mediterranea looks almost identical to its northern relative Chrysoperla carnea, but their courtship "songs" are very different; individuals of one species will not react to the other's vibrations. Larvae have either a more slender "humpbacked" shape with a prominent bulge on the thorax, or are plumper, with long bristles jutting out from the sides. These will collect debris and food remains - the empty integuments of aphids, most notably - that provide camouflage from birds. Larva of Chrysoperla carnea or perhaps C. mediterranea feeding on an aphidThe eggs are deposited at night, singly or in small groups, and sit atop a slender stalk about 1 cm long; one female produces some 100-200 eggs. Eggs are placed on plants, usually when aphids are present nearby in numbers. Immediately after hatching, the larvae moult, then descend the eggstalk to feed. They are voracious predators, attacking most insects of suitable size, especially soft-bodied ones (aphids, caterpillars and other insect larvae, insect eggs, and at high population densities also each other). Therefore, the larvae are colloquially known as aphidlions, similar to the related antlions. Their senses are weakly developed, except that they are very sensitive to touch. Walking around in a haphazard fashion, the larvae sway their heads from one side to the other, and when they strike a potential prey object, the larva grasps it. Their maxillae are hollow, allowing a digestive secretion to be injected in the prey; the organs of an aphid can for example be dissolved by this in 90 seconds. Depending on environmental conditions, larvae need about 1-3 weeks to pupation which takes place in a cocoon; species from temperate regions usually overwinter as a prepupa, though Chrysoperla carnea overwinters as newly-hatched adults.While depending on species and environmental conditions, some green lacewings will eat only about 150 prey items in their entire life, in other cases 100 aphids will be eaten in a single week. Thus, in several countries, millions of such voracious Chrysopidae are reared for sale as biological control agents of insect and mite pests in agriculture and gardens. They are distributed as eggs, since as noted above they are highly aggressive and cannibalistic in confined quarters; the eggs hatch in the field. Their performance is variable; thus, there is a lot of interest in further research to improve the use of green lacewings as biological pest control.For long, green lacewings were considered close relatives of the pleasing lacewings (Dilaridae) and brown lacewings (Hemerobiidae) and placed in the superfamily Hemerobioidea. But this grouping does not appear to be natural and misled most significantly by the supposed hemerobioideans' plesiomorphic larvae. Today, the Hemerobioidea are usually considered monotypic, containing only the brown lacewings; the green lacewings seem to be very closely related to the osmylids (Osmylidae), which have much more advanced larvae superficially resembling those of the spongillaflies (Sisyridae) with which the spongillaflies were thus formerly allied. Thus, though the superfamily Osmyloidea is often considered monotypic these days too following the spongillaflies' removal from there, it is arguably better to include the osmylids as well as the green lacewings there. I Crisopidi o Crisope (Chrysopidae SCHNEIDER, 1851) sono una famiglia di Insetti dell'ordine dei Neurotteri, comprendente specie predatrici, alcune di grande interesse nel campo della lotta biologica. Sono gli insetti pi� rappresentativi, per l'importanza e per la morfologia, dei Neurotteri propriamente detti.L'adulto dei Crisopidi ha un corpo esile e delicato, di medie dimensioni, con livrea di tonalit� variabile dal giallo al verde, facilmente riconoscibile. Il capo � ipognato, con antenne lunghe e filiformi, apparato boccale masticatore tipo, occhi piccoli ma prominenti e vistosi, spesso con riflessi metallici. Le ali sono ben sviluppate, trasparenti, con riflessi idirescenti, ripiegate a tetto in fase di riposo, percorse da una venulazione fittamente ramificata anche presso il margine. Le larve sono terrestri, campodeiformi, provviste di zampe cursorie, con il corpo generalmente depresso in senso dorso ventrale e pi� o meno slargato posteriormente, nella regione addominale. Come in tutti i Planipennia hanno l'apertura boccale chiusa e si nutrono per mezzo di un apparato boccale pungente-succhiante conformato a forcipe. Questa funzionalit� � dovuta al fatto che, in entrambi i lati la mandibola, e la lacinia mascellare sono allungate e ricurve verso il lato ventrale e conformate in modo che appressandosi delimitano un canale di suzione attraverso il quale viene aspirato l'alimento. L'apparato boccale a forcipe � sfruttato per bloccare la preda e contemporaneamente iniettarvi la saliva e aspirarne i liquidi interni. Il dorso � spesso percorso da rilievi dell'esoscheletro pi� o meno sviluppati e in alcune specie la larva si mimetizza rivestendosi con frammenti delle spoglie delle loro vittime. Le pupe si sviluppano entro un bozzolo di seta secreto dai tubi malpighiani delle larve. A maturit� abbandonano il bozzolo, prima della muta.Gli adulti dei Crisopidi hanno regimi dietetici differenti secondo la specie. In generale possono essere distinti in tre gruppi: in alcune specie sono predatrici, con regime dietetico entomofago, altre sono fitofaghe (ma di nessuna importanza in fatto di dannosit�) oppure si nutrono di liquidi zuccherini o polline, altre non si nutrono affatto. Hanno abitudini notturne e sono discreti volatori, in grado di percorrere anche un centinaio di chilometri; tuttavia il volo � irregolare e intervallato da pause sulla vegetazione. Sono facilmente attratti dalle fonti luminose. Le larve sono predatrici fondamentalmente polifaghe, anche se manifestano specifiche preferenze. In generale sono attaccati Acari, uova, Afidi o altri Rincoti, larve di microlepidotteri. Sono piuttosto mobili, molto attive e voraci e, in condizioni di carenza di vittime, facilmente dedite al cannibalismo. Cacciano prevalentemente nelle ore notturne, mentre di giorno in genere riposano protette in nascondigli.L'elemento pi� caratteristico dei Crisopidi � la particolare forma dell'ovatura: le uova sono infatti portate da sottilissimi filamenti, prodotti da secrezioni ghiandolari dell'apparato genitale della femmina. Anche se di piccole dimensioni, si possono individuare facilmente sulle foglie, spesso in prossimit� di colonie di Afidi. on the wing surface result in a fine composition. Sharpness is excellent. Une tr�s belle photo de cette chrysope. Tr�s bonne composition. Excellente nettet�. Les couleurs sont superbes et j'aime beaucoup les reflets sur ses ailes. What a good close-up of this insect. Great image with an execelnt DOF showing good details of insect's wings texture and pattern. Hi Just got home from work so running a bit late tonight so just a note to say good picture for now. TFS. Great looking insect, perfect details of delicate wings, nice colours and DOF. Perfect macro capture of this neuropteran species. TFS. Proprio una magnifica regina dalle ali di perla e dai riflessi eccezionali. Molto luminosa. Just super Luciano. You have become a big hit among some insect lovers. I for one am not a fan but do love the images of them and all of the knowledge which comes along...even if it is cut from somewhere..this way we call learn together! Perfectly focused and detailed macro capture of a Chrysopid neuronteran with wonderful clarity, DOF and POV. TFS my fiend! These are not easy to photograph but you've done really well! Great focus and lovely details of the beautiful glassy wings. Beautiful colours too and a fine composition. Superbe photo de ce tr�s petit insecte avec des couleurs et des reflets vraiment �tonnnants. Tu parviens � bien ma�triser le flash sans effets g�nants. La famille des Chrysopidae commence seulement � appara�tre ici. A splendid capture of this beautiful lacewing. Superb details and a lovely composition. Thanks a lot for sharing. Now I see your love and passion on nature in butterfly! Mi piace molto la crisopa, i buoni detagli specialmente le nervadure delle ali e il blu del corpo. Noi abbiamo una specie qui, un po differnte, Chrysoperla sp. I have to say WOW! So small and delicate yet so masterfully captured. All the details (and the info) are fantastic in this shot. Thanks for sharing.